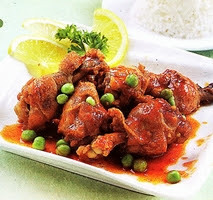 Hi today I going to share with you another one of my family all time favorite dish; Ayam Masak Merah (Chicken cooked in tomato and chili paste). This dish is serves as side dish companion to Nasi Beriani Gam. You'll find the dish will mostly served along side with dalcha and acar buah (spicy pickle). These cooking combination are regularly served during a Malay wedding celebrating the bridegroom as the Raja Sehari (a day as a King). Literally the foods serve is fit for King of the day. d. Add 4 cup of water and evaporated milk, continue cooking in medium fire. e. Lastly add potato and chicken. Let it boil for 15 minutes. f. Garnish with fried onion leaf, parsley leaf and green peas. Hi Aida, interesting recipe but please put in the measurements to the recipe, eg how much tomato puree (and size of can etc) to use. I miss my mother's cooking and always try to make here while living overseas, so ingredients such as ghee) are either not sold or banned here, so I try to substitue when I can. Can you use clarified butter instead of ghee ? thanks. First and foremost please accept my apology. It had been a busy weeks for the past 3 weeka. We were shifting to a new residential area just after the Eid Mubarak celebration. (1) You can use butter as substitute to ghee. The truth is there is no real quantity, it is all depends on your taste buds. As guide you can use half butter. If you can find ghees you can use the whole of 2-3 oz, that usually comes in a small cans. (2) Tomato puree 2 -3 oz or the entire small cans. (3) 4 cup of evaporated milk, you may not want to use too much as it will spoil the taste and texture. (4) Dried chili. I full fist or about 2oz. If you like is hot you can add more. You need to boils the chili, remove the seeds and fine wet blend. Remember not to add too much water. Otherwise your mixture will become too watery, when added with all the other ingredients.